This page is being composed in 2015. 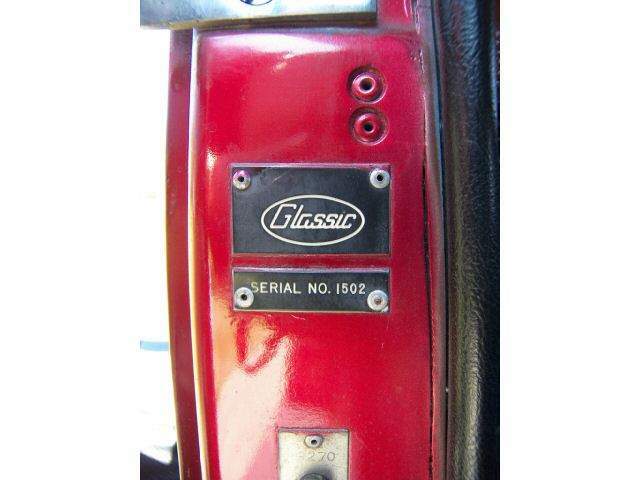 By the time we got to VINs 1500, - about 1980 or 1981, we were well into the "Replicars" name brand, yet several cars have shown up (so far) that appear to have Glassic plastic VIN tags. I will ask Joel if this holds any meaning in his recollection. who is Joel? When the first one came to my attention, I figured that someone had, perhaps, lost the VIN but had a tag and cut it apart, added his own number, and re-titled it. As other cars showed up, this became less likely, and the notion below began to take hold. The cars do not show the attributes of a 1981 Replicar (where VIN 1500 would have fallen) but also do not show all of the attributes of older cars. As of June, 2015, I (the Annexmaster) wonder if something happened near the end of production of the cars where bits and pieces were put together to make cars. While the VIN tags appear to be made up of part of an old Glassic tag, with a separate Serial number piece placed next to it -- as if an old, left over tag had been cut down to remove an old, now obsolete, number and a newer number inserted to reflect when the car was assembled. The two cars will be discussed side by side below. In August, 2015 I am beginning to formulate a guess as to what these cars are. 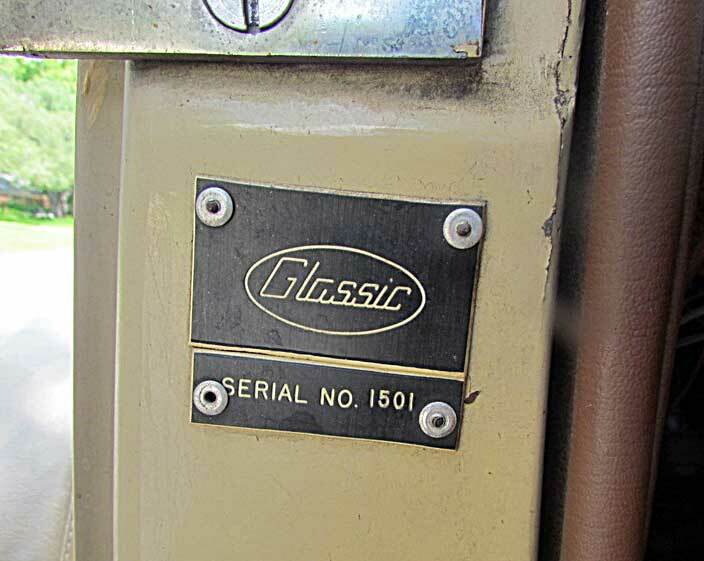 They may well have been produced in Miami, FL by the owner of Glassic when it went bankrupt in t 1974. He later, apparently, got to buy back some of the parts of that liquidation, and may have built a few cars using those parts. The fact that all three cars found (so far) have inconsistent parts, but nearly identical VIN tags that could easily have been cut-down and re-purposed blanks left over from 1974. These particular cars may also have been built by someone to whom those parts were sold later on. The G in Glassic is a type face that is not easily reproduced. This, is a theory as of now. As of 8/2015 - no Replicar with this number is recorded on the Annex. Roadster 1478, whose owner checked in in 2016, shows the same vintag configuration. Owner is in Texas. 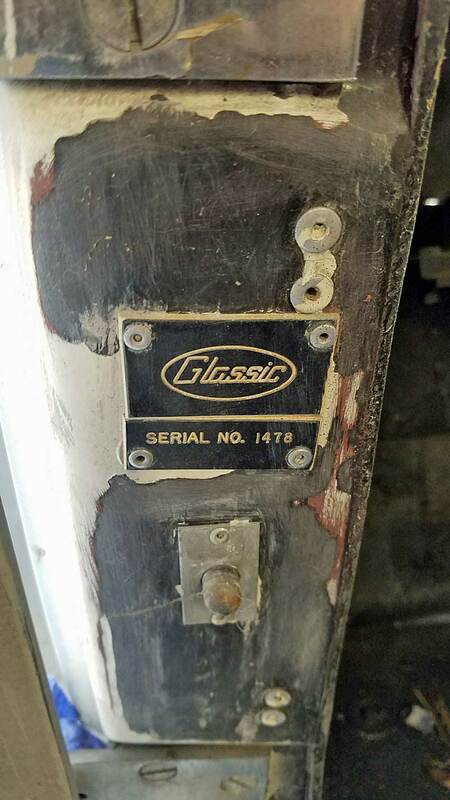 Car 1481 registered in Aug. 2015 and said the car is titled as a "1977 Glass" - the wipers are at the top, it has leaf springs. The dash shows no A/c, but the doors have features of the Replicars. I have asked him what HIS VIN tag looks like and here (above) is what he sent me. The owner reports that the engine code came back as a 1976 - he discovered this when getting a gasket for a 4-barrel intake manifold. This car has no air conditioning, or power brakes, according to the owner, yet the little button for the switch that operates the under dash light when the door is open is something most often found on Replicars. http://glassicreplicars.com/annexpics.php?mypath=0albums/VIN-1400-1505/Car_1481/ How many cars like this are there out there? We may never know. No VW parking lights or tail-lights. 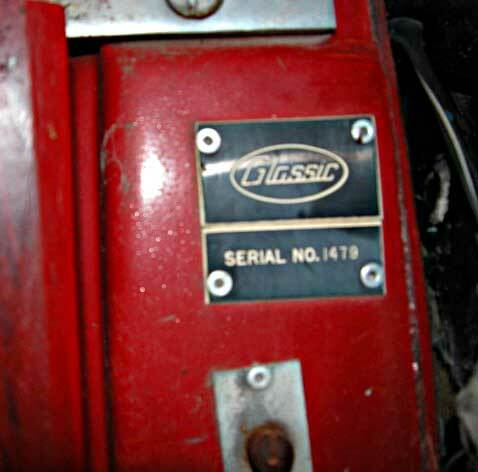 Although, many owners have removed the VW lights and replaced them with Model A lights over the years, so it is not a clear indicator of a "Glassic"
Two-piece VIN tag, the name on one piece, the number on the other. So far, no air conditioning. The Replicars had A/C, power steering and brakes. As of 8/2015 - another car with this number is recorded on the Annex - also a Roadster, and no photos and I likely guessed at the year - so cannot be sure that it is or is not the same car..
As of 8/2015 - another car with this number is recorded on the Annex - however, the VIN tag on that car is not a Replicar OR Glassic - but a made-up tag. The other car shows signs of a modified Replicar - wipers on bottom, split hood, Replicars style running board covers..
1501 is a Roadster -- at some time got designated as a 1978. This car does not have the bump on the hood sides of the older Glassic models, but has leaf springs in front but a split hood, like the newer cars. Inside door handles on this one, which were not on Glassics but would have been on a 1978 - only not of this after-market looking type. 1502 is a Phaeton also titled as a 1978 somewhere along the way. This car appears to have a door switch, which my 1978 had, but my 1973 does not. This car has a split hood, like a Replicar, not a 73 and older Glassic. The parking lights in front look like my 1973. Both cars have been done over nicely. 1502 with many custom type features. No inside door handles seen. I am still working on finding good pics of old and new hinges - they are not very often photographed in a large size. Also from the builder, Joel, in 2015.